Stumps can be very unsightly and can make it difficult to plant new trees or plants in the area. The larger the tree and the more recently it has been cut down, the more difficult it will be to remove. Deciduous trees like oaks and maples tend to have deep root systems and are much more difficult to remove than evergreens which tend to have a much shallower root system. Tree Services Annapolis does stump removal and grinding. We also do tree removal and have a tree and shrub planting service for after the tree and stump are removed. We are happy to assist not only in Annapolis, MD but also anywhere in Anne Arundel County. dissolved. Then wait a couple months till the stump is spongy and use a mattock and other tools to break up the stump and remove it. Or you can drill the holes and fill them with Epsom salt but don’t put water in. Then put Epsom salt around the sides of the stump. Finally, cover the stump with a small tarp and weigh it down so it won’t blow away, wait about 3 months and then use a mattock to break it up. 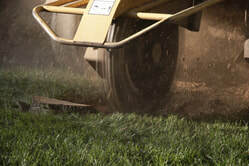 ​If that all seems like too much work and you want it removed immediately, call us. If it is small enough, we will dig it out. Otherwise we will use a stump grinder to grind the stump out. This won’t remove every last bit of the root system, but it will get the stump and largest roots near the stump ground up and removed so that it is below ground level. This not only looks better, but it reduces the chances of sprouts coming up from the stump. It also means you can plant new trees or shrubs nearby. You probably won’t be able to plant anything in the exact location of where the stump was. ​We have the following qualifications, and more listed on the About page.